One of the baseline things of coming back to World of Warcraft after playing another MMORPG is that you are returning to the silky smooth polish that is Blizzard. Or it has generally been that way in my experience. This time around it felt a little different. On wrapping up Volume I of the LOTRO epic quest lines last week I decided, after a pretty focused three month run with the game, to step away for a bit. I was already feeling that my passion for the game was ebbing a bit. It was a combination of factors. First, I had setup a rotation for my guardian in LOTRO on specific keys and, after three months of that, my fingers were going to those keys to fight pretty much automatically. The problem was that my ret pally in WoW, those keys didn’t line up. My time in Middle-earth had so solidified my response to combat that I eventually just changed my mapping in WoW to mostly line up that rotation to match where my fingers were going. Second, on returning, I noticed that my bag were pretty full, so I decided to clear them out. Forgetting the whole “don’t raise your item level or solo mobs will start beating the crap out of you because Blizzard thought that would be funny” aspect of Battle for Azeroth, one of my least favorite bits of the expansion, I emptied my bad by equipping all the much better gear I had stored away and selling off everything else. I remembered that problem once I got out in the field. It isn’t the worst thing in the world, this mobs “grow more powerful than you do as your item level goes up” thing. But I had just come from playing a guardian in LOTRO, a class that doesn’t kill all that quickly, but which can handle a lot of mobs at once. Running into the thick of things was easy with the guardian, but a big mistake with the ret pally. One or two mobs were doable, and even three, but after a three mob encounter some healing was required. I had to die a couple of times before I got a grip on how much less powerful I was at level 120 in WoW versus level 50 in LOTRO. And then there was the game itself. I played for a couple of long stretched on Saturday and Sunday, and several times I ended up with the game lagging out or the UI going unresponsive. I am very much not used to hitting a hot key and the game not catching it. This seemed to be a particular problem on Saturday evening. That is a busy time for the game, and maybe that had something to do with it as I haven’t seen anything similar since the weekend. But for a stretch WoW was not acting in a very WoW-like manner, but no other games seemed to be lagging. Despite the less than auspicious start, I pressed on. I wanted to pick up where I had left off back in early November in Drustvar. 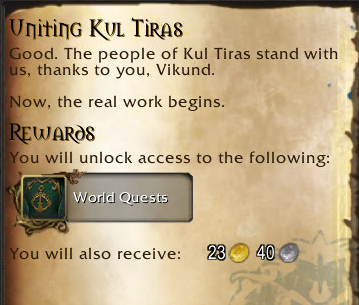 I had one more faction to work on before I would unlock world quests. But even that seemed to be going against me. All I wanted was to get to honored with the Order of Embers. The problem was that the zone opens up with a lot of quests, none of which boost you at all with that particular faction. That, and the coming of the LOTRO Legendary server, put me off WoW for this three month stretch, and in returning I found myself in the same situation. I persisted though. The quest lines are, as I have noted, pretty good. The zones are all pretty well put together and look good as well. I managed to find my stride and started to just enjoy following up on one task after another. Eventually I hit quest chains that catered to my particular factional needs, but that didn’t happen until I really got into the far side of the zone. 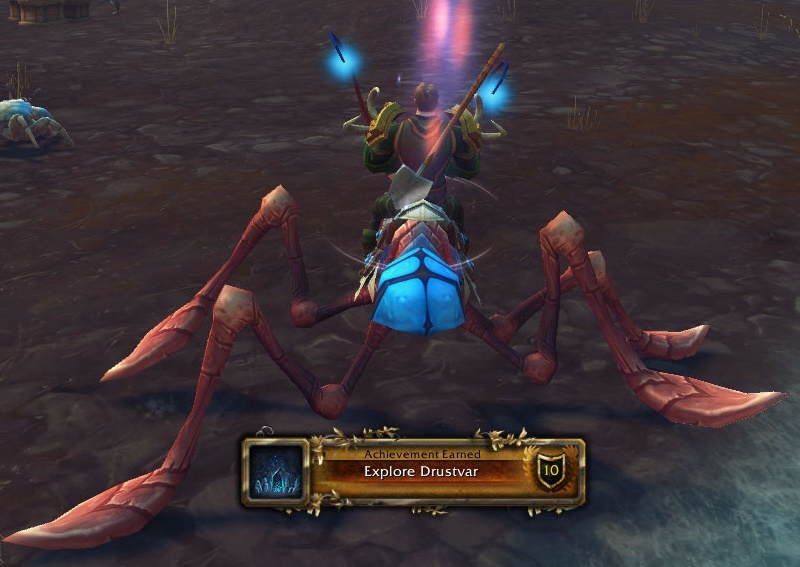 By that point I didn’t have to go very far before I got the exploration achievement. It wasn’t too far after that when I managed to hit my faction goal as well. That sent me back to Boralus to turn in the quest that unlocked World Quests as a reward. In a way, that might seem like a step backwards. I earned enough faction to unlock the ability to earn more faction related quests. But I have to admit I kind of liked the world quest stage of Legion back in the day. Doing the daily three or four quests for the emissary ended up being a nice little chunk of content to keep me going. Also, along the way, I seemed to be climbing out of the item level pit. Or I am getting better at playing a ret pally in BfA. Either way, I seemed to be doing better. I still have to finish up the story lines in Drustvar. There is an achievement to be done in that. And I seem to be back in the groove again. But for a strange day or three it seemed like WoW was losing the playability battle against LOTRO. Addendum: Also, I really got used to LOTRO putting hostile mobs on the mini-map as little red dots, so kept looking for that in the WoW mini-map for days. This entry was posted in entertainment, World of Warcraft and tagged Drustvar on February 7, 2019 by Wilhelm Arcturus. Maybe addons not updated ? i leave WOW in legion but my wife have now and then problems when an addon is not updated. she leave too WOW relativle few weeks ago. @inactiveseller – The Twitch client, formerly the Curse client, runs on my machine at startup and I use it to keep my addons up to date. And sufficient time has passed since the last major drop that all of them are on the correct version. So I do not think it is that. But I also do not run that many addons either, and the ones I have seem to be working okay. But the game also has its issues from time to time. There was a point when my client would crash if I hung around in Dalaran for more than 5 minutes at a stretch. I *think* it was the nVidia driver, but when it finally stopped happening there wasn’t a clear reason why. Well you came back at an odd time. Apparently most players have gotten so powerful they were killing guards in the world without thought. So they bumped up their health and damage, and added more. Because shame on us for improving ourselves. @Marathal- That is always the way it goes. Malcanis will have his way. No matter who you tune the game for, the other groups will find it problematic. I have noticed too, how lag seem to be happening much more this expansion, I wasn’t sure if it was my connection. Hah that comment about scaling made me laugh.